Hey there! It's Jen S. here and I'm so excited to by sharing my first post here on the Verve blog. :) I'm sharing my take on this month's Diva Dare. 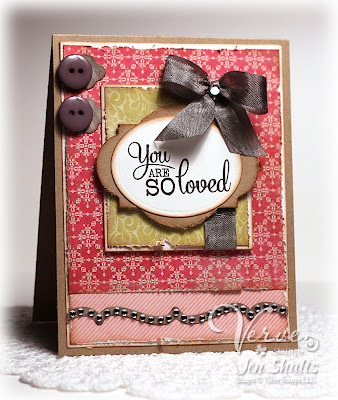 This month's Dare is to make a card inspired by Laurie's blog, Just Give Me Stamps and Maureen's blog, Buttons and Bling. My card has a whole lot of Vervey goodness throughout so here are the details... I started with a sentiment from So Fluttery and I die cut it with an oval. Then I went Verve die crazy layering the Classy Label Die behind my oval, two little Charming Banner Dies under the buttons and the Flourish Trim Die as the base for my bling. :) To finish it off I used a bit of Stormy Skies seam binding ribbon to make a little bow above the sentiment. The papers I used are from My Mind's Eye Collectable: Memorable 6x6 pad, Bazzill's kraft cardstock and the white cardstock is all mixed up in my storage file right now after an 8 year old invasion so I can only speculate where it's from but I'm pretty sure it's Choice Snow White cardstock. To get your wheels a turnin', the Divas will be posting their Diva Dare creations using our newly released products right here, each weekday, for the next two weeks. Winners will be announced on Thursday, March 28th. Finally, noted below are two ways you can win some shiny new Verve! Be a new creation - posted March 8th or later. 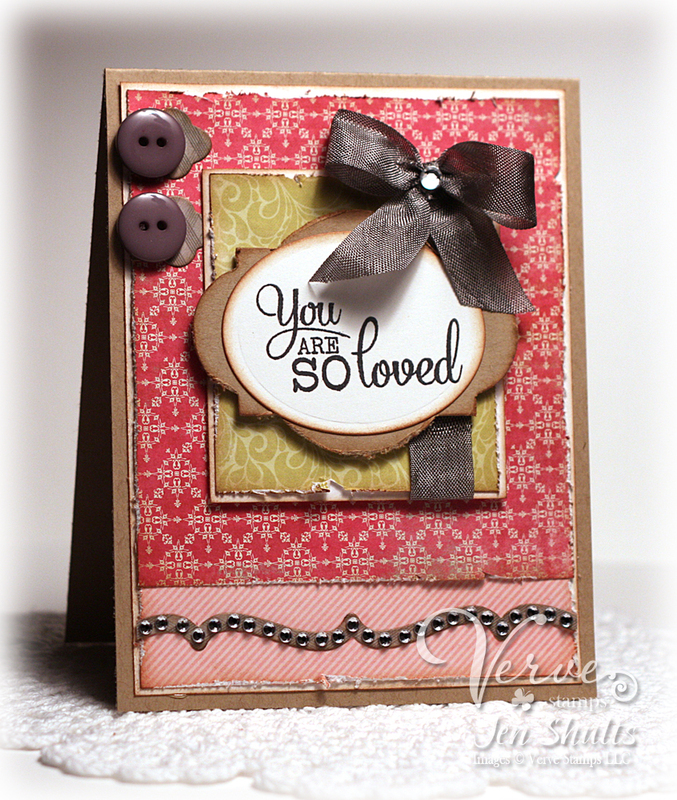 Be inspired by a Verve card or project combining Diva Maureen and Diva Laurie's style. Use at least one Verve product. Be added to the linky widget before 5pm Mountain on Wednesday, March 27. Win a Verve set of your choosing! Leave a little shout-out for the Divas in the comments section as we post our answers to this month's dare weekdays through March 25th. A random comment winner will be chosen from all the comments over the course of the Dare.